Having an office building with a clean exterior is a sometimes overlooked, yet vital way to present your customers with a good impression of your organization. Keeping those windows spotless through all four seasons of Ohio weather can be a real challenge. The Squeaky Clean Company offers professional window cleaning services for both the inside and outside of Ohio-based businesses in Akron, Canton, Cleveland and surrounding areas. Whether you have a small business in Canton with a few windows, or a multi floor commercial building in Akron with hundreds of windows, we provide quality window washing services at competitive price. 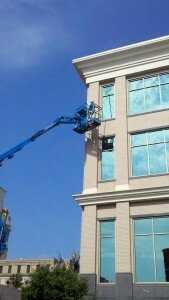 If you’re ready to get started or have an existing window washing contract you’d like a bid on, contact us today.